On our way to Mozart‘s town of birth you become acquainted with the beautiful Salzkammergut landscape with its mountains and its numerous lakes, where the Emperor Franz Joseph and his family used to spend their holidays. Skirting the Lake Fuschl and Lake Wolfgang you reach Salzburg, where you will have time for lunch. The afternoon will be dedicated to a stroll through the old city, showing you the most important sights of this old Bishop‘s Seat. These are the Cathedral, the Festival Hall, St. Peter‘s Abbey Church and its graveyard (tomb of Mozart‘s sister Nannerl). 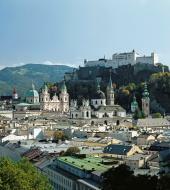 Of course we will show you Mozart‘s birth place in the Getreidegasse. The Edelweiss-Song from the movie Sound of Music will come to your memory, while passing the horse-pond and from the gardens of Mirabell-Palace you will have a marvellous view of the Hohensalzburg Fortress. Tour ends: Hotel. This tour is available in English and Spanish. Please indicate the language of your preference when booking. Please arrive 15 minutes prior the tour. The tour starts at 07:15 in front of State Opera House.